Have I got a treat for you today! I’m really excited to tell you I’ve been talking to Ashleigh Swan, better known as super blogger, Ashleigh Money Saver. Ashleigh started her site back in June 2013 as a Facebook Page for sharing her love of a bargain with her buddies. It soon spiralled into more and in September 2014 she chose to give up the day job to pursue Ashleigh Money Saver as a business. The Ashleigh Money Saver Facebook page now has over 247,000 likes!! And the site is going from strength to strength as she prepares to take on the big boys in price comparison. I absolutely love hearing stories and experiences from top bloggers about their story, how they started out and, well, literally the nitty gritty of their days… and even more so if they have a family and are balancing a hectic work life with raising children. Because not only is Ashleigh a top blogger but she’s also a mum of 3 kids (she has a 12 year old step-son, an 8 year old son and a 4 year old daughter). Her story is fascinating and I personally can take a lot from going with your passion and really using it to make a business for yourself! 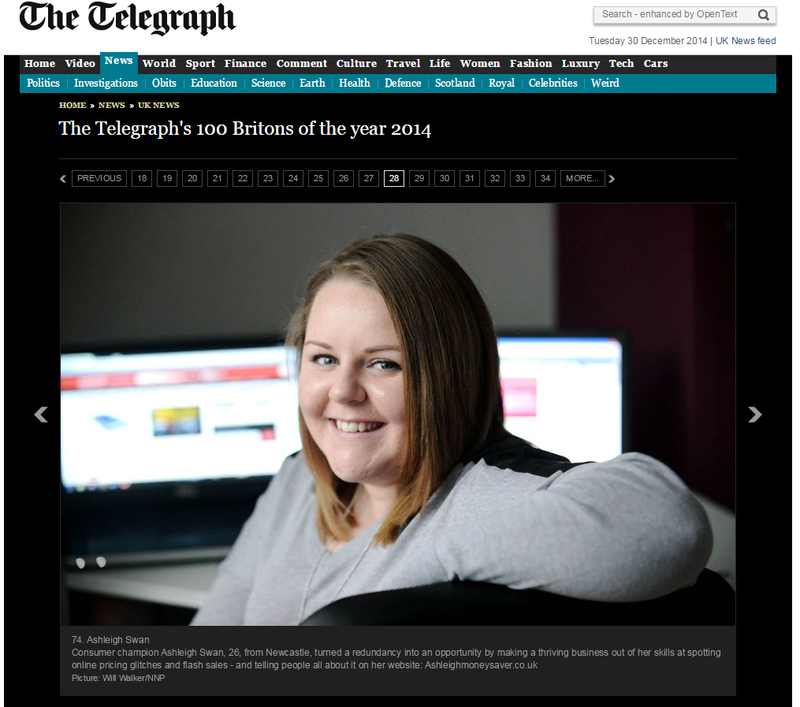 Ashleigh’s rise to fame meant she was also named in the Telegraph’s top 100 Britons for 2014. Go Ashleigh! 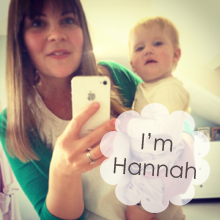 Whether you’re interested in blogging and business or money saving or working motherhood, I think you’ll enjoy this! 2. What is Ashleigh Money Saver? Ashleigh Money Saver is THE place to go for all the latest deals, bargains, sales, offers, voucher codes and glitches. I promise I can help you save money, whether it’s on toys or days out, there are great savings to be had. You can see loads of offers, tips and tricks on ashleighmoneysaver.co.uk or by liking me on Facebook. 3. 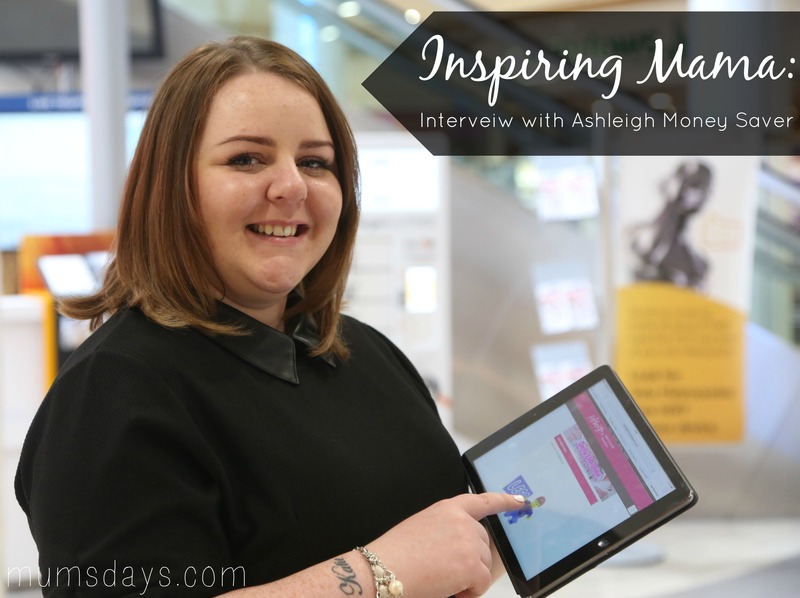 What inspired you to start Ashleigh Money Saver? Would you say you were always interested in saving money? Was it your passion or did you spot a gap in the market? I hate paying full price for anything and always have done so while bargain hunting for myself I’d be sharing whatever I found on my personal facebook profile with my friends. I had friends telling me I had a nack for finding great deals and offers and I should make a page to share them with more people. So in June 2013 I made the Ashleigh Money Saver Facebook page and it grew from there. 4. What did the early days of Ashleigh Money Saver look like for you? I was working part time in a pharmacy, so I would spend the morning working on Ashleigh Money Saver and then go to work in the afternoons. I was surprised how quickly it grew, my friends were tagging their friends, sharing, etc. and the likes just rocketed. I had a good few hundred within the first few weeks. Unfortunately I was made redundant from the pharmacy around a month after I started Ashleigh Money Saver as the pharmacy wasn’t busy enough. I would then spend the morning job hunting and applying for everything I could find and spend the afternoon on Ashleigh Money Saver to keep my mind busy – day time TV wasn’t up to much anyway! 5. When did you know you were on to something?! What was your breakthrough moment with the site and when did you move to working on the site full-time? A little while after being made redundant I managed to find a full time job in another pharmacy so I was so glad to be back to work but it meant I had less time for Ashleigh Money Saver. I would just be using my breaks and evenings to keep on top of the page but I missed getting to work on it every day. The page was continuing to grow massively and I felt like I didn’t have a life at times because I didn’t have enough time to have a day job as well as Ashleigh Money Saver (I also have a husband and three children!) and that’s when I realised I couldn’t keep the two up and I would have to choose between them. After giving it a lot of thought and talking with my family, I decided to take the risk of making Ashleigh Money Saver a business. I realised I could make a small income from advertising if I got a website and I decided to give up my job in the pharmacy and go ahead with a website as well as the Facebook page. So the business was born in September 2014! 6. What has been the hardest thing about running your own business? The work load! There have been times where it has just been so busy and not enough hours in the day for everything that needs to be done. The run up to black Friday and Christmas was a massive time for me and the posts were going out thick and fast and it felt like I was working 24/7! 7. Have your goals changed as your business has grown? Presumably they are more ambitious? Or did you always want to take on the big boys?! Because this started out as a hobby I never expected it to end up where it is now so now everything I post has more thought put into it. I want real bargains that make people think ‘Wow!’ I want exclusive deals that you can’t find anywhere else and I want to be known for the place to go for all things money saving. I think I’m bringing a fresh approach to money saving. 8. What did you do to grow your Facebook page to over 240,000 fans? And how long has it taken? The majority of likes have come from fans sharing my offers. I also ‘boost’ some of the most popular offers so more people can see them and hope that they like my page. We have also run a lot of competitions which proved really popular, especially around Christmas when we gave away big toy bundles for a boy and a girl – that competition post ended up being seen by nearly 2 million people and added loads of new likes. All of the PR I have got has also added loads of new likes, so it’s been a combination of things really. 9. How many hours do you work now? Have you managed to find a good balance between your busy working schedule and family life? 10. Finally, what advice do you have for other mums interested in following their passions as a career? Thank you so much, Ashleigh! I love your final tip, you are so right. Good luck with your ambitions, I have every faith you’ll get there and I’m excited for you. Thank you for being so open and sharing the ups and downs of juggling a business and motherhood – I’m glad to hear it’s not just me. Did you enjoy this interview with Ashleigh Money Saver?! If so, please let me know and I’ll look to find more inspiring mamas to interview! This post is brought to you in collaboration with Ashleigh Money Saver. All content, ideas, words and questions are my own. Thanks for supporting the sponsors that allow me to create new and original content like this for Mums’ Days. Wow, this was an inspiring read. Thank you, I’m off to check out her page! I just found about Ashleigh. She sounds wonderful and she’s done so well for herself! I have one question for her, if she reads this: What is the best bargain you have ever bought? I would LOVE to know! Good question!! I have had so many! it is amazing what Ashleigh has accomplished in such a short space of time. Great post, never heard of this lady so thank you for sharing. I shall now head of to FB page as I love good bargain! Well done for the interview and well done to Ashleigh for turning our hobby into her earnings. Mumpreneurs think outside the box and they dare to step outside the box. How brave to give up her day job; I’m sure she’s glad she did. All the best Ashleigh! I used to really enjoy your blog but now I feel as though it’s only written for other bloggers. It’s a blog about blogging now. It’s obviously very flattering for you to be accepted into the bosom of this clique but you are running the risk of losing your existing readership and alienating any prospective readers. 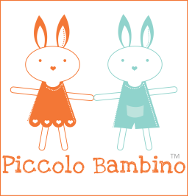 Have you lost your way and lost sight that this used to be a blog for mums? Hi Joanne, Thank you so much for taking the time to comment, I truly appreciate it. I’m so sorry if you feel that there is not enough content on here for you at the moment. I think you might be right in that I have lost my way a bit. I try to write what I’m interested in so that the content is always genuine, and I am hugely interested in how other mums spend their time, balancing their work/business and interests around their kids, which is why I felt this would be such a great post (I still believe it is!!). If it’s OK with you, can I ask your opinion on a survey I’m going to do to find out what my existing audience would like more of?